If your idea of heaven is a mountain of edible cookie dough, filled with real, delicious Oreo cookies, heaven just got a little bit closer. 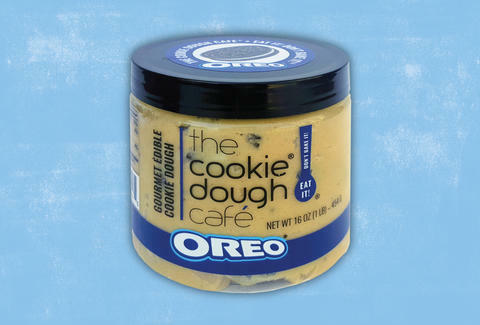 The culinary snack slingers at Oreo and The Cookie Dough Café seem to understand, as the latter is now selling a "gourmet" take on safe-to-eat cookie dough with a special Oreo-filled flavor. The Illinois-based cookie dough shop confirmed it recently launched the jars of scoop-able Oreos, when reached by Thrillist on Wendesday. The company is selling pints of the stuff at Chicago store Mariano's and will begin rolling it out to the masses via its online store starting August 23. For now, the dough addicts among you will just have to wait. If you need to get your cookie dough fix sooner than that, The Cookie Dough Café currently sells other flavors like Chocolate Chip, "Monster" (a peanut butter M&M–filled creation), and Confetti. The online store ships nationwide via FedEx, and if Jet.com ships to your state, you can also buy pints from there. Failing that, you can always try making your own.